When you do something that you have wanted to do since you were 9 years old how can you possibly put it into words? Especially when it ended up surpassing the expectations that had built up over two decades? You can’t. Or better said, I can’t. We could start this story in 1986 with a 9 year old me getting his first package of baseball cards. I was into the cards before I was into the game. Or we could begin a few months later, with me on the stairs to our family room, way past my bedtime, crying harder than I ever had before as replays of Bill Buckner booting a routine grounder ran over and over on the TV. I suppose that’s where it really started. As much as that game pained my 9 year old head and heart I was ready to root for the Red Sox come springtime. When Karin and I lived in New Jersey we would buy partial season packages to Yankee stadium and would see 12 to 15 games a year. Now, I am and always will be, the most die hard Red Sox fan but, I do like to think that I am a fan of the game first and foremost. And of course I do now and always will hate the Yankees but damn if Yankee stadium wasn’t (I have yet to see the new one) a great place to see a ball game. (not like Shea. Never liked that place.) But mystique or no, I never got goosebumps walking in there like I have each every time I have walked into Fenway park. No joke, every single time. I love how it’s so tucked into the city you can be only a block away and still miss it and get lost. I love that it’s so old it’s become uncomfortable to many. I love the fact that many seats face centerfield rather than the infield so you end up slightly turning your head for a few hours to watch the plate. I love the different shades of green – from the grass to the wall to the seats with details of red leading up to the blue sky of a summer day. I love that it’s the same place I saw on tv as a 9 year old with my baseball mitt on, wondering what it must feel like to walk on that grass. I don’t have to wonder any more. A few months later the same contact at Hasbro asked us to take part in a radiothon which you can read more about here. That was awesome too. Our contacts at the hospital were always so appreciative but as Karin and I repeatedly tried to explain it truly was the least we could do to help out the place that had done so much for our little boy. The thanks were ours to give not theirs. Which is why it was such a shock to receive an email from the good folks we had worked with explaining that local boy done good and Boston Red Sox relief pitcher Dan Wheeler had donated a bunch of tickets to the hospital along with the opportunity to arrive at the game early to go out onto the Fenway field before the game to meet him. They, in turn, wanted us to use them to take Liam to his first baseball game. Three weeks after Liam was born and we were receiving the news of his diagnosis and processing the future of our family and how it would be different from the future we had predicted the natural impulse to think about things that I wouldn’t get to do with my son would creep in from time to time. I’ll never get to teach him to drive, Or to ride a bike, or to hit a curveball and yes from time to time even in the last few years the idea that I’d be taking Liam and his ventilator into a crowd of 35,000 germ covered baseball fans seemed damn close to impossible. But when is another chance like this going to come up? 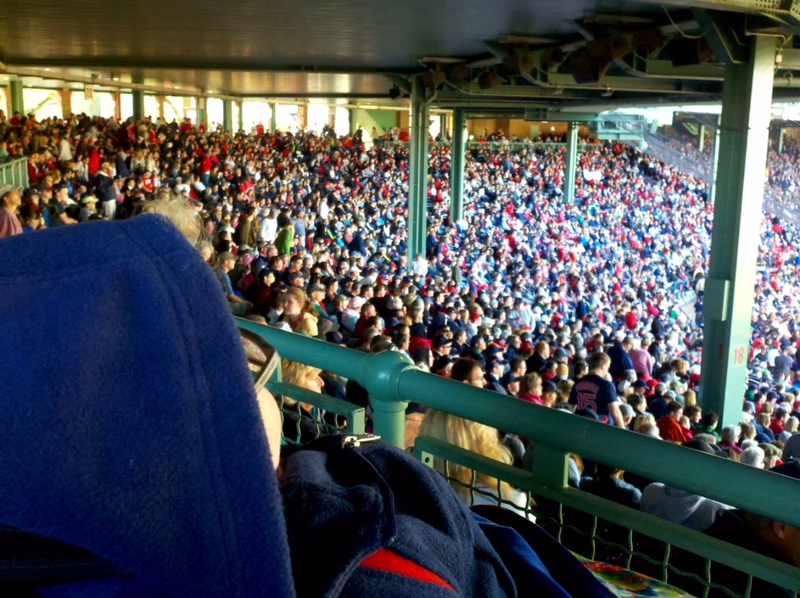 So last Sunday we packed up the boy and invited some family and shipped up to Boston for Liam’s first Red Sox Game. I was taking my boy to see the Sox. We arrived on time (barely) and were whisked through the gate and past everyone in line until we were inside the park itself when our guide explained that we would be seperated for a second so that the rest of the group (some family that we were lucky enough to bring with us) could be brought down the stairs to the field. We waited alone in a hallway as I giggled in anticipation of the next few mintues when a large Boston Police Officer moseyed over to us. He didn’t even acknowlegde Karin and I but instead squatted down next to Liam’s wheelchair and placed a plastic BPD badge on his chest and said to him “Buddy, you’re going to be my deputy of Fenway today.” Then he stood up and walked away. It was a very cute moment in every sense of the word cute. Our guide came bouncing around the corner and in a flash we were pushing Liam down a ramp and onto the field at Fenway Park. I know I waited a week to even write this post but let’s just say that again and let it sink in shall we? We were pushing Liam down a ramp and onto the field at Fenway Park. Ok, now that we’ve all caught our breath. Players were milling about all over as they got ready for the game and talked with other groups and took photos. There wasn’t a whole lot of autograph signing going on at first and that was fine with me. We truly were just happy to be there. We bumped over some TV cables and were greeted by pitcher Trevor Miller who quickly asked a question that only ‘one of us’ would understand. Karin instantly caught it. “Whoa, sounds like you know what you’re talking about there!” she said to him laughing. Turns out his daughter has a trach. He is one of us. It was awesome. 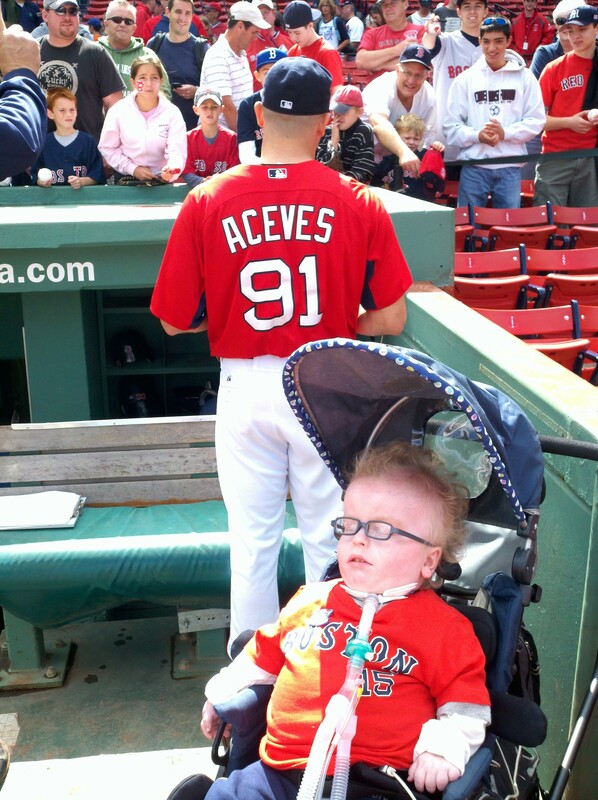 He laughed with us and wished Liam fun at his first baseball game before jogging off to begin his own warm-up. The family who came with us were behind a stantion that corraled them down the edge of the field on the first base side as we were told to hang out right in front of the dugout. 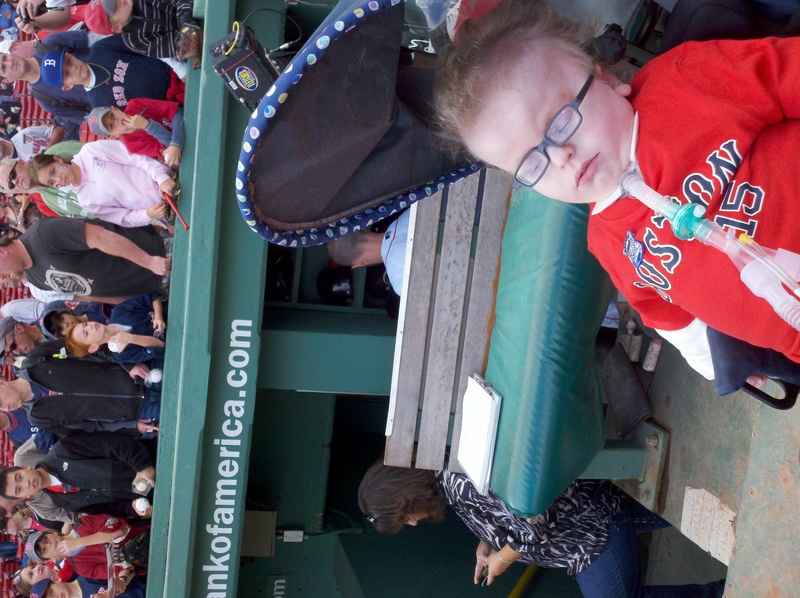 Why yes that is Dustin Pedroia's head behind that bench. I couldn’t stop smiling the entire time. All of the sudden Relief Pitcher Alfredo Acevez came bounding up the clubhouse stairs and out of the dugout. He crouched down next to Liam without hesitation, kissed him on the check before even I knew what was going on. He laughed and rubbed Liam’s belly before saying “welcome to the game!” and laughed a bit more before turning around and signing for the fans who had begun to trickle into the park. Our guide kept telling us that Dan Wheeler was in the physical therapy room getting treatment and should be out soon as I told her that our expectations had already been blown away and that there was no need for anyone to rush on our account. It was getting closer to gametime and she seemed to be getting nervous about it. No offense to Dan we were about to meet someone much cooler. That’s when HE came out. We were standing in front of HIS bench. In front of HIS seat. He was sitting there when Kevin Millar worked a lead-off walk against Mariano Rivera. He was sitting there a few pitches later when Dave Roberts stole second even though everybody knew he was going. He was there when Bill Mueller drove Roberts home. Terry Francona walked out to his bench and got ready for the game. He was all focus. He placed his stack of scouting reports on the seat and he found a few rolls of athletic tape and started taping two lineup cards to the wall as I stood only a few feet away getting Liam to look over and trying not to wet myself. “That is Mr. Terry Francona Liam!! Liam can you believe it! That’s Mr. Francona!” I had kept my cool the whole time until then but how could I not be excited. Our guide stepped up as we were watching him and pulled me to the side. “Dan can’t make it up, the doctors are still working on him so he’s not gonna make it to meet you..” She seemed sad to be the bearer of bad news but I assured her that just being able to see the game was enough for us and to tell Dan that we all said thank-you. She seemed relieved and backed off a bit while I went back to staring at the laser-focus of the first manager to win two world series championships in the 21st century. He seemed oblivious to the crowd around him. He made sure all his stuff was exactly where he wanted it before shocking us all by hopping up two of the three stairs and playfully rubbing Liam’s belly (!!!!!!!!!!!! 8-0 in World Series Games rubbing Liam’s belly!!) said “Hey Buddy” signed a ball for him and the baseballs that my cousins had brought and ran back into the clubhouse with a nod. I don’t have pictures of that moment which is ok by me. I’ll never forget it. I hadn’t even processed what had happened when we were being brought off the field and escorted to our seats for the game. The handicapped seating for Liam’s chair was good, had a great view of the field even if it was back a ways. It was high enough that even if everyone in front of us stood we could still see the field. The usher for our section was attentive and helpful and we made fast friends with the other families in our section who also had some special needs. The Sox lost but it didn’t much matter. I was sitting at a ball game with my son beside me. Meeting Tito, getting on the field, being startled by Aceves? All great and gravy but really, what’s better than sitting at a ball game with your boy? Days later Karin would still find me staring off in the distance with a goofy grin on my face. She didn’t even have to ask after a while. I’d snap out of it and give her a look before saying ” Terry Francona rubbed my kid’s belly!”. And to think that it all started with me writing a few posts on this blog. Just a game . . .yeah, right. ← Haircut to tide you over. It’s 6AM and your story had tears streaming down my face. What an amazing day for your family, and I loved that you shared it so eloquently. Wishing you all the best! Tears of joy- streaming (yes, my shirt is getting wet -streaming) It may have been a week before you typed the words, but it the way you tell it is amazing – just like that day was! It is my birthday. You are making we cry on my freaking birthday. Not fair. I got nothing else. Just some tears. Joyful ones. I will just let the rest sit with me and soak it in. Oh, I meant “me” not “we” … see I couldn’t see and type through the tears! That is a FANTASTIC story. Really great. It makes me miss a lot of things about the game, about Camden Yards, back when I was such a die-hard Orioles fan, but most of all it just shows me why you are such a terrific representation of humanity and Fatherhood. Seriously, this post made me cry more than any other post ever has. Best post ever. What a wonderful story, beautifully written! I’m so happy for you all! Thanks for the big smile on my face! I need a tissue too…….Heard that you all had such a wonderful time. Love all the great photos.